Urban Chickens Network blog: egg labels: just what do they mean? When Sophia (one of our two urban chickens) was molting this winter, I had to make a run to the local Whole Foods to pick up a dozen eggs for baking, and I was floored at the choices available to me. Sure, many of the packages showed illustrations of happy chickens in wide open spaces, but what were their living conditions really like? Natural. Free Range. Certified Organic. Cage-Free. Certified Organic*: The birds are uncaged inside barns or warehouses, and are required to have outdoor access although there have been concerns about lax enforcement, with some large-scale producers not providing birds meaningful access to the outdoors). They are fed an organic, all-vegetarian diet free of antibiotics and pesticides, as required by the U.S. Department of Agriculture's National Organic Program. Beak cutting and forced molting through starvation are permitted. Compliance is verified through third-party auditing. Free-Range: While the USDA has defined the meaning of "free-range" for some poultry products, there are no standards in "free-range" egg production. Typically, free-range egg-laying hens are uncaged inside barns or warehouses and have some degree of outdoor access. They can engage in many natural behaviors such as nesting and foraging. However, there is no information on stocking density, the frequency or duration of outdoor access, or the quality of the land accessible to the birds. There is no information regarding what the birds can be fed. Beak cutting and forced molting through starvation are permitted. There is no third-party auditing. Certified Humane*: The birds are uncaged inside barns or warehouses, but may be kept indoors at all times. They must be able to perform natural behaviors such as nesting, perching, and dust bathing. There are requirements for stocking density and number of perches and nesting boxes. Forced molting through starvation is prohibited, but beak cutting is allowed. Compliance is verified through third-party auditing. Certified Humane is a program of Humane Farm Animal Care. Cage-Free: As the term implies, hens laying eggs labeled as "cage-free" are uncaged inside barns or warehouses, but generally do not have access to the outdoors. They have the ability to engage in many of their natural behaviors such as walking, nesting, and spreading their wings. Beak cutting and forced molting through starvation are permitted. There is no third-party auditing. Free-Roaming: Also known as "free-range," the USDA has defined this claim for some poultry products, but there are no standards in "free-roaming" egg production. 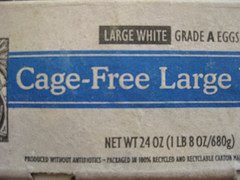 This essentially means the hens are cage-free. There is no third-party auditing. United Egg Producers Certified*: The overwhelming majority of the U.S. egg industry complies with this voluntary program, which permits routine cruel and inhumane factory farm practices. By 2008, hens laying these eggs will be afforded 67 square inches of cage space per bird, less area than a sheet of paper. The hens are confined in restrictive, barren cages and cannot perform many of their natural behaviors, including perching, nesting, foraging or even spreading their wings. Compliance is verified through third-party auditing. Forced molting through starvation is prohibited, but beak cutting is allowed. This is a program of the United Egg Producers. Vegetarian-Fed: These birds' feed does not contain animal byproducts (unlike that consumed by most laying hens), but this label does not have significant relevance to the animals' living conditions. Natural: This label has no relevance to animal welfare. Fertile: These eggs were laid by hens who lived with roosters, meaning they most likely were not caged. Omega-3 Enriched: This label claim has no relevance to animal welfare. Interested in showing your support of poultry receiving humane treatment from the large agribusinesses? Sign USHS's Petition for Poultry.